use your imagination to go on animal adventures. Did you finally give in and turn on your heat if you live where it is cold? With the crazy New England temperatures fluctuating between highs of 75 and lows in the 20's, I was trying to hold off on turning on the heat, as I hoped for a few more warmer days. But, for those who know New England weather, you get greedy and then you hit with cold temps. :-) And, now I am waking up to frost on the lawn and even a few snow flurries last night while it was raining out. Go figure! So, on November 1st, I turned the heat on and it will stay that way until spring time. Argg, not a fan of the cold -- even though I have lived in New England all my life and should be used it to it by now. Last year all the craze at the holidays was the mermaid tail blankets -- which you can find at Fin Fun for that mermaid loving fan in your life. This year, Wild Things Blankets will be a hit with kids, as they keep them toasty warm during the cold winter months. Just imagine wrapping yourself in a soft plush polar bear, black bear or even lion wearable blanket with comfy hand pockets to keep your hands warm, after you come in from playing in the snow. "Each of the Fin Fun' Wild Things soft plush hooded animal blankets feature a comfortable design with hand pockets that easily wrap/cascade around the body. Special touches: animal ears, eyes, paws or flippers will make kids literally go wild while enjoying imaginative play." My girls love their Wild Things Snapper animal blanket. 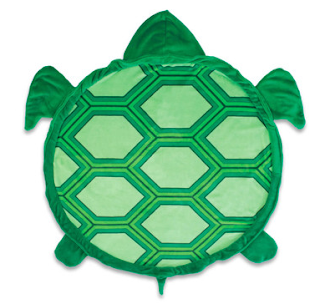 Even if they aren't cold, they are reaching for this wearable blanket to pretend they are a sea turtle crawling along. It is really cute to see them get creative with this wearable blanket. And, as a parent, I love when I can purchase a product that has a dual purpose -- 1. It is a wearable blanket that will keeps your kids toasty warm when it is cold out; 2. It is also a fun blanket the kids can wear for imaginative play. What more can you ask for? And, at only $29.95 each, you can't go wrong for the price. I just ordered another Snapper blanket so each of the girls will have their own to wear and keep warm with. Don't stress over what to get the kids on your shopping list this holiday season? Instead, head on over to the Wild Things blankets by Fin Fun website and order one of their many animal wearable blankets today. Styles are available in youth size only, and include: Snowcap Polar Bear, Snapper Turtle, Timber Brown Bear, Cinder Black Bear, Roary Lion. Sleeping bag styles include Thrasher Shark, Titan Orca Whale, and Polar Penguin. Available on wildthingsblankets.com and Finfun.com. MSRP: $30. This blanket is so cute and something several of the kids would love in the family.